Musical bouncy castle? Outside the Waterfront! 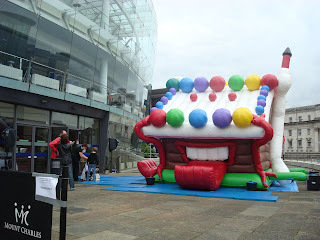 Today, adults and children were being encouraged to go for a bounce outside the Waterfront Hall. Imagine hooking a bouncy castle up to a computer and a PA system. And then adapt the music as people change their rhythm of bouncing. Put together by Andy Best & Merja Puustinen, Empty Stomach 2009 is part of the ISEA (International Symposium on Electronic Art) conference which is being held this week in Belfast. Starting to look at websites which belong to public bodies does feel a bit like looking under a stone and realising that while it’s shiny on top it can be all muddy and dirty underneath. Firstly, hats off to Lisburn City Council. When informed about the missing minutes and bad links quite quickly published most of the misplaced minutes online and fixed the erring pages. Just 24 March and a special meeting of the full council on 18 April remain absent. Someone suggested taking a look Magherafelt District Council’s website. But more than six years on, a reasonable ratepayer might have expected the council to have upgraded? Unfortunately I can’t find much evidence of some of the classes of information (ie, document types) being available online. Council minutes seem to be available as photocopies, but not kept for online browsing. And the ICO’s specific “examples of the kinds of information that we would expect district councils in Northern Ireland to provide in order to meet their commitments under the model publication scheme” seems miles away from what Magherafelt say they provide. Nothing about most recent election results, no timetable of council meetings, no register of councillors’ interests. Oh, and emailing them last night on their published enquiry address was useless as the messages were bouncing! To finish off, back to the District Policing Partnerships. To recap, I’d noticed that the Lisburn DPP had lots of missing information on their website. They hadn’t updated their homepage to announce the public meeting in August; had only half the 2008 minutes published and none of the 2009 ones; their link to a calendar of meetings was broken; and they have the wrong phone number on their How to ask questions page. Flicking through other regional DPP sites, some seemed to be a better state. To be fair, Lisburn DPP did reply very quickly to my email pointing out the issues and the local DPP Manager explained that the Northern Ireland Policing Board host the DPPs’ websites and are in the process of updating them. However, at the moment “there have been unavoidable delays in the process”. The good news is that “it is due to go 'live' by the end of the week”. ... Not later than 7 working days after the report of the meeting in public of a DPP has been formally ratified, the report must be available on the DPP website. While public attendance of Lisburn DPP meetings is still high when compared with other districts, the total attendance did fall by more than a third between 2007/8 and 2008/9. So communications in general may not be working ... or else 2007/8 had some particularly well attended meetings. So is any of this important? Obviously to many people it’s not, as if they’d asked earlier, much of the information might not available and not missing. But doesn’t that point to a lack of engagement by society in the (very many) public bodies that help administer and monitor its affairs? 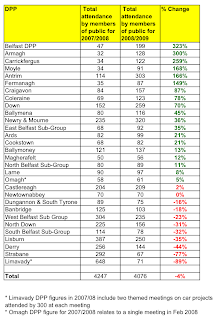 While Northern Ireland councils may be unwilling to make large scale improvements in the face of imminent changes to their number and distribution, now is a good time to highlight the good, the bad and the ugly. To me, it seems that it’s all very well having central guidance and thought through best practice. But if public bodies on the ground don’t follow the advice, then it’s the public at large who are less well informed about what is being done on their behalf, or inconvenienced in not being able to quickly find out. Is your council website only giving the illusion of transparency and public accountability? Council websites are a bit of a mixed bag. They contain a lot information, but often require a lot of navigation to traverse the sites to find out what you want to know. Where is the nearest amenity site, and does it recycle the widget you want to throw out? On which day will your rainbow coloured bin be collected? Can you get a compost bin? When will your local District Policing Partnership next meet? And where? What time’s the next full Council meeting? It’s one thing publishing information. It’s another making people aware that the material is now available, and quite another to publish it in a usable format. Let’s pick on Lisburn. Seems fair since that’s where I currently pay rates. 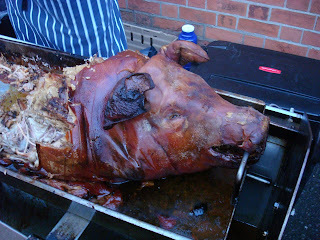 Having moved back to the town city earlier in the year, I wondered what the local council were getting up to. Despite complying with the Freedom of Information Publication Scheme and producing a Definition Document outlining the range of information that will be voluntarily published and kept up to date, what you find is not always fit for purpose. Nothing for March, April or May. (I wouldn’t expect June’s minutes to have been signed off before the full council meeting in September.) That’s three months of Council business that’s unavailable to local ratepayers. Update - Tuesday 6pm - April, May and June now online - still no March 2009. What about the Lisburn District Policing Partnership? Another local body associated with the City Council. Even worse. No minutes published online for 2009. Some of the 2008 minutes still missing. The date of the next meeting is apparently 13 May 2009. (The link to the Calendar is broken. And just noticed that the phone number is incorrect - "082" instead of "028" on the How to ask questions page.) So the public August meeting may well have been and gone, without been promoted on the organisation’s own website. Not really good enough. Surely minutes should be made public within 24 hours of being signed off. If that covers making the material available, then there’s the matter of being in a usable format. While most of Lisburn Council’s committee meetings are published as PDFs, the full Council meetings that I’ve looked at thus far are a mixture of Word and PDF. The majority of the PDFs that I’ve looked at are scans of the printed documents. Not sure why, as there are no signatures. But the upshot is that the scanned documents are not machine searchable. Surely council publications should be in a usable format, ie, searchable? What about letting people know what’s happened? Local resident can’t all be expected to buy their local weekly papers to read about the council meetings and committees (if they’ve been covered in any detail). Notice of council and committee meetings, and agendas nearer the time. Lisburn City Council have a regular pattern of full council and committee meetings on various nights of the month, there are extra special meetings and data changes due to public holidays. So although LCC have a calendar - recently updated, cough! - for the next four months worth of meetings (which omits the Full Council dates), there’s no way for the public to find out about extraordinary meetings. A feed of minutes published to the council public document repository. Minutes often lag the meetings by a month or three (depending on the signoff procedures and whether they have to be taken to the full Council for ratification). So would be good for the council to push out to online ratepayers when information is available. If Councils are serious about accountability and transparency, and they intend to use online tools as a way of promoting what they are doing, then I reckon they need to put a bit more effort. At the moment, it’s another example of the medium obstructing the message. If you’re living in another council area, why not look up their website and post a comment below to say what you find. Are their minutes up to date? Can you tell when and where you’d have to go to sit in and watch the next meeting of their planning committee? Does your local DPP keep their site up to date? PS: Very happy for Lisburn Council to take up their right of reply by email or in a comment! We holidayed in Scotland this year – back in early July. We’d arrived in Edinburgh in early afternoon. The weather was atrocious. Parked up in a central multi-storey, we headed out into the city, aiming to get as little wet as possible. So we headed down the street to see the Scottish Parliament. The first view of it was the far wall of the MSP office building. Each MSP office has a uniquely shaped window seat set into the wall, allowing MSPs time to reflect on the matters of their day. Not sure how many use their thinking spots? Apparently part of the opposite wall of their offices is clear and looks out onto a big corridor. Heading around towards the front entrance, winding our way along the blast proof wall that surrounds Scotland’s seat of democracy, the public entrance is easy to find and as welcoming as an airport scanner can be! 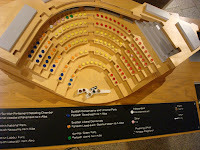 There’s a small exhibition area documenting the history, shape and size of the parliament and its buildings, and plenty of leaflets (translated into plenty of languages) to explain what you can see. Since it was the summer recess there was no restriction on heading upstairs to wander around the visitors’ gallery and take photos overlooking the main parliament hall. The parliament complex was designed by Spanish architect Enric Miralles and his EMBT Architects practice. Like everything in politics, the choice of site, architect, design and spiralling costs were all criticised. 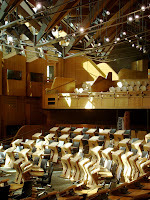 Although neither Miralles nor First Minister Donald Dewar lived to see the completed construction and opening of the building, their wish for a building that reflected Scottish landscape, people and culture – and one with a debating chamber that would encourage consensus politics – was largely successful. I’m reading Alan Balfour’s account of Creating a Scottish Parliament at the moment. It tells the interwoven tales of a fascinating political and architectural journey. That the initial vision and highly conceptual drawings (ie, don’t look like much!) should have produced such an appealing and functional building is a triumph. Recommended reading for anyone interested. Two items in the shop stood out. One were the mugs celebrating ten years of devolution in Scotland. 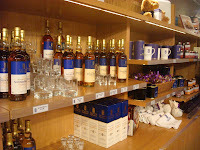 The other the Scottish Whisky being openly sold alongside teddy bears and tea-towels. I’m not expecting to see either of these up at Stormont! It’s a beautiful building that feels very open, accessible. If you find yourself in Edinburgh, plan to visit it. There’s even a crèche that you can book children into if, as a member of the public, you’ve come to watch or take part in a committee session. The Northern Ireland Assembly is constrained by the edifice at the top of the hill at Stormont (Parliament Buildings to be precise), and already has a functioning debating chamber and committee rooms. But there is surely much about the ethos and atmosphere of the Scottish Parliament that can be considered when improving the current public facilities and engagement at Stormont over the coming months and years. In the ever expanding calendar of Belfast festivals, no sooner is one over than another will soon begin while tickets go on sale for the next! Flicking through the Belfast Festival at Queen’s programme this morning, a few events stuck out. Though the high ticket prices also stuck out! I’m sure they’re great affairs, but it’s rarely the opening concerts that catch my eye – even if they do feature the Mariinsky Orchestra or 70-year old word-smiths Seamus Heaney and Michael Longley. Belfast’s Synagogue up on the Somerton Road is always worth a visit. This year the visit of The Jewish Way of Life exhibition coincides with the festival. “An interactive and accessible ... interactive guide to Judaism.” Runs from 13 October through to 20 November. 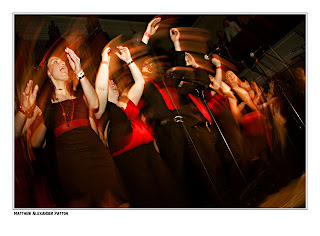 Los Desterrados last played in Belfast Synagogue back in March 2008 and it was a great night. They’ll be back in Belfast on Sunday 18 October, this time in the Spiegeltent. Expect a toe-tapping night of flamenco, jazz and laughs. After their recent successes with Two Roads West, Kabosh are premièring Gavin Kostick’s new play This is What We Sang at the Synagogue on Thursday 22 and Sunday 25–Thursday 29 October. Set on the Jewish Day of Atonement – Yom Kippur – five family members relate their life stories and seek absolution for their past as they tell the story of their home city Belfast. Update - now reviewed. Urban Hymns was a sell out success in May Street Presbyterian Church at last year’s festival - and made into a fabulous film. The Unforgettable Choir will once again feature The Inishowen Gospel Choir backing a myriad of artists on Monday 19 October, this time in Belfast City Hall. Update - now reviewed. While the new Lyric Theatre is still not much more than a set of foundations, they are taking over the Elmwood Hall for next season’s productions. On Friday 23 October, there’s a chance to take a virtual tour of the new building with architects from O’Donnell & Toumey. In a more light-hearted session, Amnesty’s Stand Up For Justice comedy gig will be tickling ribs in the Ulster Hall on Tuesday 20 October. Former BBC reporter and independent MP Martin Bell will be speaking in the Elmwood Hall on Tuesday 27 October. Outraged at the lack of honest politics, Bell is working with Terry Waite to recruit independent anti-sleaze candidates to stand in constituencies at next year’s general election. The first piece of commissioned public art will be launched in the Titanic Quarter on Thursday 29 October. Tony Stallard will give a talk and his Kit sculpture will be unveiled in the ground floor of the ARC Abercorn Residential Complex (ARC) which is about to complete its first phase. There’s a 90 minute conducted floodlit bus tour of Belfast’s Architectural Heritage leaving from outside the QFT that will take in Queen’s City Hall, St Anne’s Cathedral, St Peter’s Cathedral, Clifton House, Ulster Hall and Stormont. Conveniently for the festival, both the Ulster Museum and Belfast City Hall will reopen around the time of the festival. The Ulster Museum are sponsoring the showing of two observational documentaries about the Irish artist Sean Scully in the QFT (Wednesday 21 and Sunday 25 October). If you enjoyed Channel 4’s Red Riding trilogy earlier in the year, you can catch the three powerful and disturbing films on the big screen in the QFT over three evenings (Tuesday 27, Wednesday 28, Thursday 29 October). Lastly, four year olds and up may enjoy the story of Pinocchio as told with puppets and shadows in the Old Museum Arts Centre between Tuesday 20 and Saturday 24 October. And there will be free Musical Storytimes featuring pirates and giraffes and the Live Music Now’s Fell Clarinet Quartet in the Spiegeltent (5–8 year olds, Tuesday 20 and Wednesday 21 October) and Ardoyne/Ormeau Road Libraries (3–5 year olds, Friday 23 October). Some tickets are already on sale. Others will be released online on Monday 24 August. Now updated with links to events on festival website now that booking is open. "The mathematical botch job that is music"
Clearing out old podcasts – the slow way: by listening to them! – I came across a fascinating discussion on the Open University/Radio 4 co-production More or Less, a regular series that looks behind the “numbers, statistics and figures [that] guide our lives”. Having played the violin as a youngster, and bashed out chords on a keyboard before switching to the sound desk, I’ve been familiar with scales and chords for much of my life. But I’ve also been aware that tuning isn’t an exact science. Our ears can be deceived. And while major and minor keys together with tones and semitones are the norm in Western culture, quarter tones and all kinds of other patterns can be appreciated too. A third of the way through the 7 August programme (starting 12 min 32 sec in to be precise) there’s a lovely piece that looks at the maths behind music, tuning, perfect fifths, and the practical compromises that have been made over the years. MIT’s Personas tool is difficult to describe. It’s a little like peering inside someone’s head as they Google for you and watching them put together the connections and form an impression of your life, work, interests and online contributions. After typing in your name, for a couple of minutes you’ll watch it wander through cyberspace, picking up nuggets about you, interpreting them, pushing them through its algorithm, and finally displaying a graphical representation of how it categorises your life. It was a reminder to me of the huge amount of information stored online about me, much of it created by people I know - including myself - but some as a result of offline activities and much more obscurely sourced. And it’s a reminder about my digital legacy - the footprint of information that will probably outlive me by many generations and be available to any historians who want to trail through my past. Also proof that if you’ve got a fairly unique name, you’re a lot more identifiable and discoverable! The characterisation of John Smith is a lot less precise! Personas is one part of the Metropath(ologies) installation at the MIT Museum’s Connections exhibition, looking at “living in a world overflowing with information and non-stop communication”. Magnus Mills’ novels are an acquired taste. Like a dark chocolate that leaves a lasting sensation on your tongue. 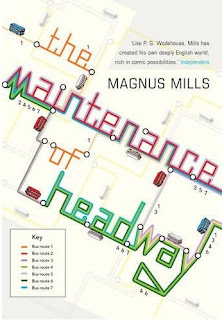 His latest tome – The Maintenance of Headway – is a welcome publication, since it’s been a couple of years since I read Explorers of the New Century and ages since the previous ones. At you turn the first few pages of any of his novels, it feels like you are reading a terribly simple story. And then, slowly, a sense of unease creeps across you, as dark and subtle twists and lapses in normality are introduced into the story. Perversion pervades (distortion, not sexual). It’s classic Mills. A book about rules, and the people who set and police them. A book about pettiness. Sometimes even a parable about anti-pragmatism. And yet there’s more. While Mills has covered transport before in The Scheme for Full Employment, this time he extends the metaphor and moves it up a level with the examination of corporate objectives and management mandates, looking at how the different workers cope with seemingly sensible/stupid policies, and how poachers can turn gamekeepers as they are promoted from bus driver to inspector. If anything, it’s not as deeply dark as his previous work. There’s either light at the end of Mills’ tunnel or I’m particularly tired and weary from work these days! At 152 pages, it’s a short read, and definitely not as excruciatingly depressing as I was expecting. Which was nice change since no doubt the next book will be a tense one to make up for it! As always, strongly recommended. And do check out John Self’s more in-depth review over at The Asylum. An interesting video highlighting some of the statistics that sum up social media and its reach across the world. A useful summary to sit alongside a film like Us Now. Did you spot where the word "skip" was missing? When it comes to campus novels, David Lodge is right up there with Malcolm Bradbury. His early work focussed on the adventures of young lecturers. Then he graduated to telling the stories of mid-career academic job swaps. Now in Deaf Sentence, we follow Desmond Bates, a retired professor of linguistics. With the onset of hearing loss, Bates has taken early retirement and is adapting to the slower pace of life just at the point his younger wife’s business and career start to take off. Hearing aids aren’t good in crowds or noisy environments, so Bates spends a lot of time nodding, smiling and wandering off to refill his glass. Generally not closely following what is being said, he ends up in all kinds of contorted situations. And it’s through one of these ill-understood encounters that he first meets Alex and later discovers that he has agreed to meet her to talk about her thesis on the linguistics of suicide notes. Cue the mandatory opportunity for inappropriate student staff liaison. Bates’ old father is living alone in London with hearing problems of his own. The passing years and failing health add to the son’s workload. Throw in a trip to Auschwitz and you’ve got a dark novel. Many of the review quotes on the book’s cover and first page refer to comedy and wit. While the book was littered with funny lines - and the misunderstandings brought about by Bates’ deafness could be droll - I was left with a feeling of pathos and tragedy rather than comedy and wit. Deaf Sentence is an average read, and certainly worth picking up if you’ve read David Lodge’s previous stories. But it felt like this pun-titled book could be end of the road for Lodge’s campus novels. No doubt you'll let me know! Further shots over on Flickr - very few of ships ... they were too hard to see! Who would stand on carpet like that? 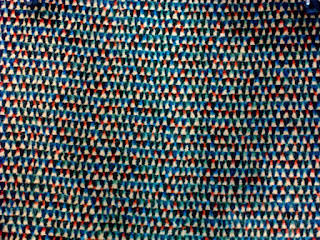 Any guesses where this carpet is laid? Clue - it's somewhere in Edinburgh. I fear that Littl’un’s memory of last Saturday’s visit to the Tall Ships will be strangely similar. She’ll remember walking along in a throng only equalled in density by the pre-Christmas crowds in Marks and Spencer. She’ll remember the mud. And although we were early and didn’t have to queue more than fifteen minutes to get on-board the Tenacious (well named for the characteristic of those waiting on the quayside) I’m not sure that wandering around the deck will have left her with an impression of the size and majesty of the tall ships. The people that I’ve met with the most vivid experiences of the Tall Ships seemed to be the ones who wandered (or cycled) down to the Odyssey late on Wednesday or Thursday night. No crowds blocked their view of the assembled fleet. And the people who saw the vessels moving on the water, and not just moored. Coming out of church on Sunday morning (well, a bit after 1pm – the tea and buns are good) and heading up over the M3 to join the M2 for Antrim, I caught a few seconds glance of the flotilla heading out of Belfast Lough. In the distance, ahead of a line of small boats, one of the tall ships was powering its way towards the open water. The hull rose out of the water, half way or more up the height of the yacht’s masts. It was enormous. Its scale was visible. 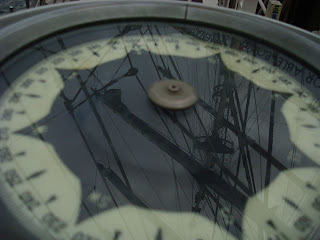 The most impressive view I had of the tall ships. Much was good about the Maritime Festival. Even with the teething problems of Thursday, the traffic management seemed to work remarkably well given the volumes of visitors. Thousands of people got parked in the three park and ride sites. Hundreds were unsuccessful each day. Keeping the M3 flyover passable for much of the day to get the Boucher Road overflow across to Airport Road was an impressive achievement in itself. The Odyssey site was a mixed bag of activities. The Expo tent had some interesting stalls, but wasn’t signposted, and was due to the one way entrance/exit system mostly visited by people on the way out rather than the way in. In general, circulation around the site was haphazard. I saw some people carrying leaflets and maps, but have no idea where they found them. We didn’t get into the BBC science tent to see its show but no doubt liquid nitrogen was impressive. The cluster of Headroom tents were surreal – must try and figure out which part of the licence fee (if any) it fell under – and the deck chairs provided a welcome rest while some clay was fashioned into a princess. And nice to catch up with Campbell and the BBC Bus again! 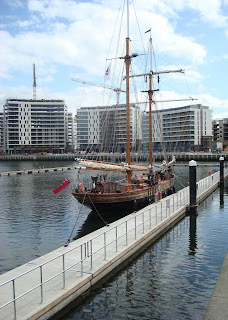 Overall, despite the media build-up (mostly fascinating and well intentioned) and the general hype, I reckon my perception of the Tall Ships was coloured by not seeing them under sail. 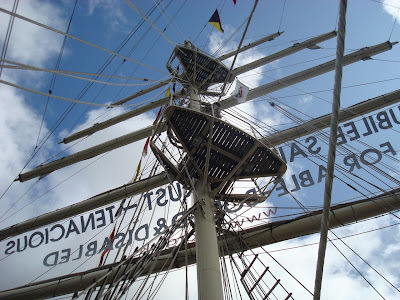 But if it did take our mind of recent difficulties and provide a focus for fun, food and a bit of queuing, then I’m still glad the Tall Ships came to Northern Ireland. By the way, there was still one parked moored around the back of the Odyssey at lunchtime. Not sure when it’s due to leave, but worth a wander if you couldn’t get close with the crowds. And an enormous cruise liner had docked on the opposite side. An entirely different species of tall ship. 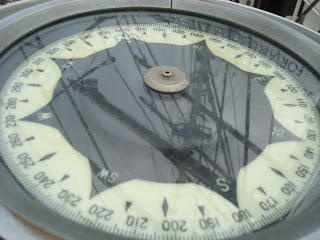 Update - interesting commentary on the Tall Ships experience over at A Life in Northern Ireland blog. For all its wires and wizardry, PCI’s Tech Camp forces me (and probably the other leaders too) to annually re-evaluate what it is I’d like the campers to go home having experienced, learnt and understood. And this morning’s conversation with William Crawley and Simon Jenkins on Sunday Sequence (starts after 1 minute 15 seconds), further distilled my thinking. Personal skilling is one thing. But the idea of weighing down their congregations with new ideas and possibilities is sometimes frightening! What if fourteen campers all ended up voxpopping, making videoing, animating, blogging and ringing out their PA systems to eliminate feedback in each of their congregations? There’d be pandemonium, angry letters and frustrated parishioners. While everything is possible, not everything is desirable. If a PA system howls every time someone speaks, it’s worse than useless. If the words and images up on the screen at the front are distracting, then they’re getting in the way of the message. Despite being a natural technophile, I probably advocate a very conservative minimalist approach to the use of technology in churches. Success is when it’s there but not noticed. When the PA just works, allows you to hear the voices and instruments that you need to when you need to and doesn’t go wrong in a way that you notice. And when it comes to screens … projected lyrics need to be as consistent and reliable as a paper hymnbook. By the time your tongue is curling around the last syllable of a verse, your eye has moved to the beginning of the next verse ... and that’s the point you need to change slide. And when it comes to illustrating sermons and talks, less is more. One picture. Perhaps no words. The trick is to master technology, rather than become its slave. In a hastily concocted analogy this morning, I suggested that a joiner doesn’t always use a hammer. He has a toolbox full of tools, and uses the most appropriate one, often the most subtle. And so it should be with technology. Unless you want the medium to take over the message, go easy. Update - great article about PowerPoint over on BBC News website. It discusses the pitfall of slides being "verbal crutches for the speaker, not visual aids for the audience" as well as the problem of bullet points. It's been a bit quiet on the blog for the last week. And I have an excuse! 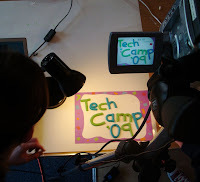 The annual Tech Camp organised by the Presbyterian Church in Ireland may be a week when I'm off work, but it's probably one of the busiest weeks of the year. Living, eating, sleeping and doing all manner of techie stuff with fourteen 13-16 year olds. A geocaching scavenger hunt around Belfast (amazing that you can leave tupperware clues in the open for hours on end). Setting up a blog and talking about twitter. A visit to UTV and U105 - including sitting in on the "One Take Pammy" recording of the 6.30pm and 10.30pm weather reports (at half four in the afternoon). Making videos to support a Mac vs PC debate - irony was that all but one of the PC-supporting videos were prepared on Apple Macs! Taking over Banbridge community radio station 102.4 Shine FM for four hours on Wednesday. Clay stop motion animation, and inspiration from animator William Barr. Learning the basics of putting together a PA system, and valuable lessons about feedback. Photography workshops and a photo walk. A trip to laser quest round at the O-zone (only one injury requiring an icepack). Evening worship and a chance to feedback what they'd learnt to parents and friends before the final BBQ. A busy week. Probably best described by the audio package the campers pulled together with the help of the staff on BBC Northern Ireland's newly re-skinned Community Bus that came to visit on Thursday. Now just to burn the week's content onto DVDs for the campers, return the borrowed kit, and unpack all those cables and gadgets until next year.